This week, to huge applause in the office, it was announced that we are finalists at the BESMA (British Excellence in Sales and Marketing Awards) 2016, in not just one, but TWO categories! Company Shortcuts has been selected as a finalist for ‘Training Centre of the Year‘ and Nicola Cook our Chief Opportunity Officer and CEO, is a finalist for ‘Sales Trainer of the Year‘. 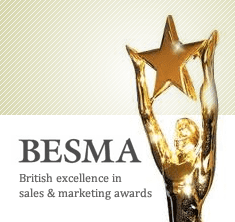 BESMA was established to recognise and reward the best sales professionals in the UK, showcasing their achievements and products, helping promote the art of selling across the country. “Company Shortcuts exists to help businesses grow faster, in line with the vision of ambitious leaders, through bespoke sales training and business advice. Time and time again, sales leaders and business owners have applied our Sales Acceleration Model to great effect and I am thrilled that our commitment to professionalising sales, along with other industry leaders, is being recognised through these awards. BESMA is organised by the Institute of Sales & Marketing Management (ISMM) – the UK’s largest professional sales body and seeks to reward the efforts of the individuals and the teams that drive company performance and recognises the roles played by sales professionals in driving the UK economy forward. As a team, we have worked extremely hard this year to expand our reach and adapt to the needs of sales professionals and entrepreneurs needing bespoke training solutions to enable business growth. This year BESMA will be held on 9th March 2016 at the stunning Grosvenor House Hotel, hosted by one of the finest comedians Dara O’Briain, with entertainment from the Legendary musician, producer and co-founder of the Eurythmics Dave Stewart.